The Juniper Networks QFX5100 switch provides the flexible foundation required by today’s data center, contributing to a simple, smart and open MetaFabric architecture that accelerates the deployment and delivery of applications within and across multiple sites and clouds. 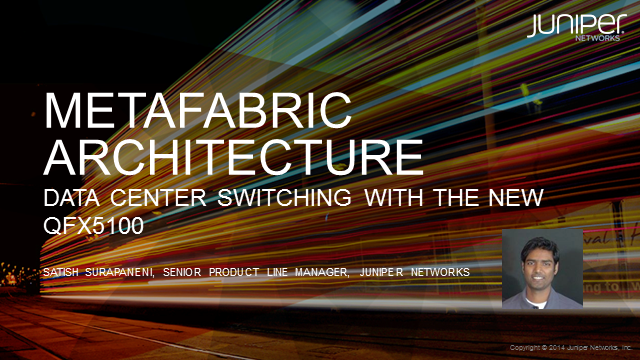 Join Satish Surapaneni, Senior Product Line Manager at Juniper, for a deeper look at Juniper’s new QFX5100 line of switches and learn how they address your current and future business needs while protecting your existing data center investments. Register now to attend! Cyber attacks are on the rise. Particularly those aimed at Web applications and servers, which deal in high-value traffic and typically reside in data centers. Application-level DDoS attacks are exhausting data center infrastructure and hacking is exploiting vulnerabilities in the Web layer. Data centers are the victims of the outside-in threat and it’s only going to get worse. While signature-based solutions prevent from known attacks, detecting and mitigating unknown attacks requires a different approach. Register now! Post event, attendees will receive a copy of the just-published IDC white paper, Unique Security Challenges in the Data Center Demand Innovative Solutions. We design, deploy, and maintain advanced technologies that enable our customers to achieve operational excellence at substantial OpEx savings. Our core strengths include a concentration on networks, their security & optimization with a laser focus on redefining the fulfillment experience. We are driven to add value at every step by providing access to inventory, streamlined credit, integration with your procurement organization and real time status information. These are all reflective of our value-added philosophy. We have developed solutions for leaders from Wall Street to the Web. What makes us different is our concentration and commitment to exclusive relationships with leading vendors.